Jewish Humor Central: OU Certifies Kosher Impossible Cheeseburger, But Where Can You Find It? OU Certifies Kosher Impossible Cheeseburger, But Where Can You Find It? According to the website of the Orthodox Union, the kosher certification agency has given its certification to the Impossible Burger, a meatless creation that mimics the taste and look of a beefburger and even "bleeds" like the real thing. As kosher Jews, the cheese burger, or even eating dairy following a burger, have always been off limits. That is, until Tuesday, May 22, when Impossible Foods partnered with the OU to certify their Impossible Burgers as OU Kosher’s newest kosher products. The Impossible Foods Company differentiates itself from other vegetarian companies by making especially authentic tasting meat, cheese and fish that can fool even the sharpest tongues. The Impossible Burger, their first kosher product, is made using wheat, coconut oil, potatoes, and special ingredient, Heme, a molecule that gives the burger its meaty taste. Heme contains iron and can be found in every single plant and animal. The Heme molecule in plant based Heme is identical to the Heme molecule found in meat. That’s what allows for the richness of the Impossible Burger. 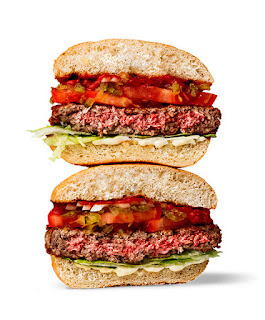 What chefs say differentiates the Impossible Burger from other veggie burgers is simple: the Impossible Burger really does bleed like a meat-based burger. With this meat free technology, kosher Jews can finally enjoy a burger with whatever toppings they want, including cheese! It sounds great, but where can you find it? It's not yet available in supermarkets -- only in select (so far not kosher) restaurants. According to Dani Klein, creator of the YeahThat'sKosher website, the only kosher restaurant that carries the product is Shilo's in Los Angeles. Shiloh’s is a meat restaurant. Much of the excitement for the Impossible Burger was to mimic the taste and texture of real meat and add real cheese for a near-authentic cheeseburger. Shiloh’s can’t offer that unfortunately. Numerous kosher restaurants around the country are testing the Impossible Burger in their restaurants, and YeahThatsKosher will be updated as more kosher places add this hot new item to the menu.